William Stephens was born in 1898, the son of Joseph Hudson and Mary Moriarty. The Stephens family lived at 43 Lincoln Street, Richmond and William attended the North Richmond State School. William spent four years with the senior cadets and worked as a railway porter when he completed school. On 14 June 1915, William’s older brother Henry enlisted but it was almost another year before William was old enough to join him. 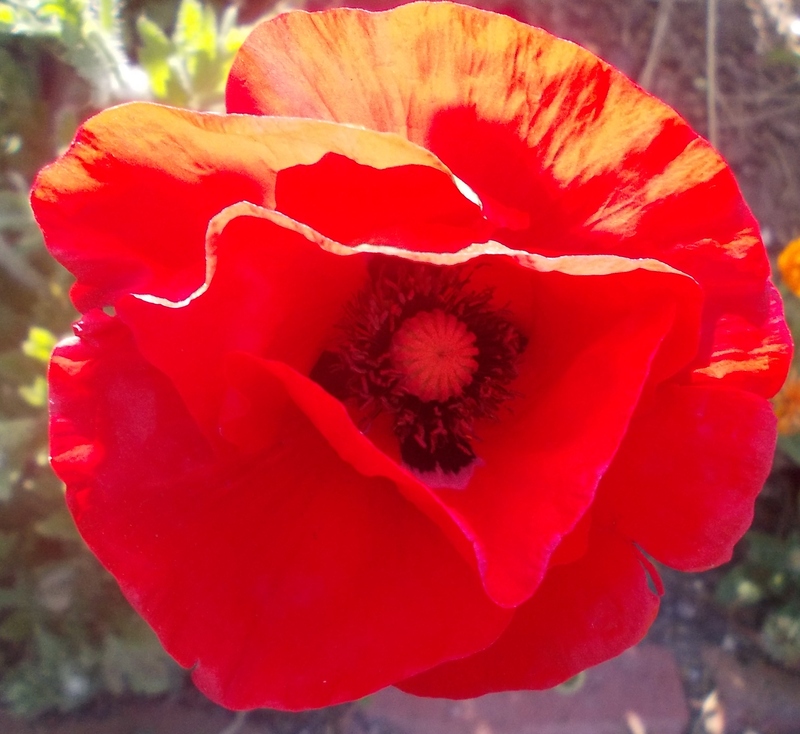 When he was eighteen and one month old, William went to the enlistment office at Brunswick and signed up. Departing Australia on 20 October 1916, William arrived at Plymouth on 9 January 1917 with the 5th Reinforcement of the Anzac Cycling Battalion. He spent the next four months in training at Larkhill, including some time in hospital. William arrived in France on 26 April 1917 and transferred to the 22nd Battalion, joining them on 14 May 1917 at Mametz. Williams was with the third platoon of A Company. The 22nd Battalion were soon to move on to Bouzincourt where they remained until 28 July. They then went by train to Arques in northern France then marched on to billets at Campagne-lès-Wardrecques where they remained until they moved to the Dominion Camp near Reninghelst, Belgium on 13 September. The 22nd Battalion then moved into the front line at Westhoek Ridge on 17 September for two days before moving to the support lines at nearby Hanebeek on 21 September. Shelling was heavy on 22 September and overnight into the 23 September. They were relieved overnight on the 23rd/24th with a loss of twelve men over the two days. 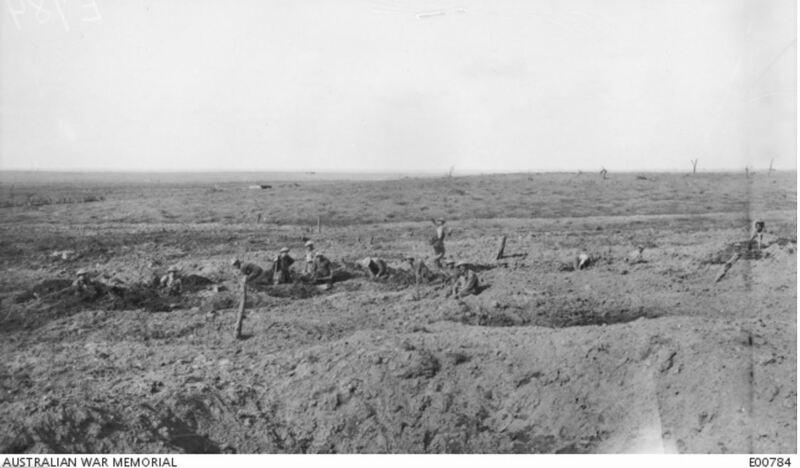 One of those was William Stephens, killed somewhere near Anzac Ridge (below) either late on the 22nd or early on the morning of the 23rd. William was just nineteen years and four months old. He was buried on a ridge about 800 metres south-west of Zonnebeke. Several other men were also buried there from the same attack. Later they were exhumed and buried at the Sanctuary Wood Cemetery. As William’s remains could not be distinguished from one of the other men, his headstone reads “Buried Near This Spot”. 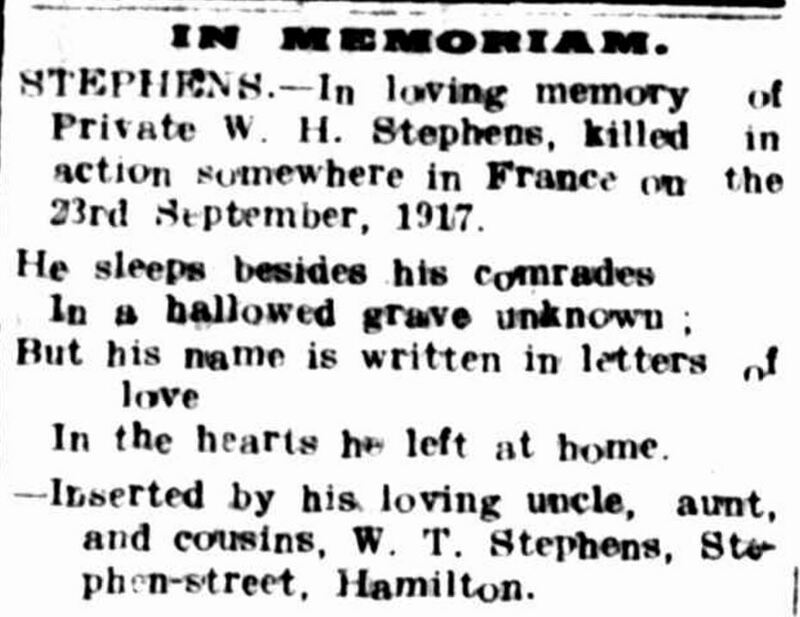 On the first anniversary of William’s death, his uncle William Thomas Stephens of Hamilton published an “In Memorium” notice in the Hamilton Spectator. “Family Notices” Hamilton Spectator (Vic. : 1870 – 1918) 24 September 1918: 4. Web. 16 Apr 2017 <http://nla.gov.au/nla.news-article119506646&gt;. William’s brother Henry returned to Australia on 18 December 1918. He was wounded three times during his service, the last occasion, a gunshot wound to the leg which saw him repatriated. He married and a son was born. Henry died at his parent’s home in Richmond on 24 August 1929, aged thirty-three.